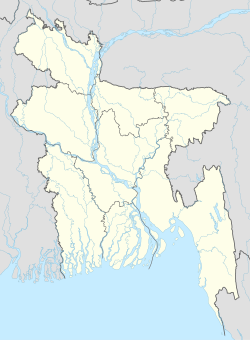 Boalkhali (Bengali: বোয়ালখালী) is an Upazila of Chittagong District in the Division of Chittagong, Bangladesh. Boalkhali is located at 22°22′40″N 91°55′15″E﻿ / ﻿22.3778°N 91.9208°E﻿ / 22.3778; 91.9208 . It previously had 33514 households and its total area is 145.44 km². According to the 2001 Bangladesh Census, there were 36,588 households. As of the 1991 Bangladesh census, Boalkhali has a population of 195607. Males constitute 51.75% of the population, and females 48.25%. This Upazila's eighteen up population is 98116. Boalkhali has an average literacy rate of 48.5% (7+ years), and the national average of 32.4% literate. As of the 2001 Bangladesh census, the population was 201,590, comprising 104,601 males and 96,989 females. Boalkhali had 9 Unions, 31 Mauza and 30 villages and the literacy rate was 71.8%. Agriculture and manufacturing are the two major economic sectors in Boalkhali. The main crops grown here are Paddy, Mustards, Onion, Garlic, Chili and other vegetables. The KorolDenga hills are very fertile for cultivating fruits. The main fruits cultivated here are Jackfruit, Mango, Olive, Papaya, Guava, Kamranga, Banana, KoshshoGula, FyinnaGula, Boththa, Aamra, Pineapple, Lemon and Jambura. The main trees planted in the Koroldenga hills are Agar, Rubber and Teak. The bank of Karnafuli River is also very fertile for cultivation. There are so many fisheries, dairies and poultries in Boalkhali Upazila. There are a lot of Hats and Bazars in Boalkhali. Hazir Hat, Chowdhury Hat, Munsi Hut, Jomadar Hat etc. are famous Bazar. The transportation of Boalkhali Upazila is very developed compare to other parts of the country. People can navigate through Karnafuli River, Rail, Bus, Tempoo,CNG(Local Taxi). For Rail there are two stations one in Gomdandi and another one in Bengura. Boalkhali has 10 Unions/Wards, 36 Mauzas/Mahallas, and 34 villages. Boalkhali Municipality was formed by nine wards in 2012 and is located by the whole Former East Gondandi Union, West Gomdandi unit 1 to 6 and Khadurkhil unit 1 to 3 from Union Parishod. Binod Bihari Chowdhury, revolutionary, was born at Uttar Bhurshi village in 1911. Kalpana Datta, revolutionary, was born at Sreepur village in 1913. Shefali Ghosh, singer, was born at Kanungo Para village circa 1941. Rama Chowdhury-War heroine of Bangladesh Liberation war. ^ a b Golam Kibria Bhuiyan (2012). "Boalkhali Upazila". In Sirajul Islam and Ahmed A. Jamal (ed.). Banglapedia: National Encyclopedia of Bangladesh (Second ed.). Asiatic Society of Bangladesh. ^ "Population Census Wing, BBS, 1991 data". Archived from the original on 2005-03-27. Retrieved November 10, 2006. ^ "Revolutionary Binod Bihari dies". bdnews24.com. 10 April 2013. ^ Bandyopadhyay, Sailesh Kumar (2012). "Datta, Kalpana". In Islam, Sirajul; Jamal, Ahmed A. (eds.). Banglapedia: National Encyclopedia of Bangladesh (Second ed.). Asiatic Society of Bangladesh. ^ শেফালী ঘোষ : তার কাছে ঋণ. Risingbd.com (in Bengali). 11 July 2014.